Communities In Schools of Delaware (CISDE) – part of the nation’s largest and most effective organization dedicated to keeping kids in school and helping them succeed in life – today announced a $694,400 AT&T Aspire contribution that will enable the organization to expand its integrated student services model to more schools in Delaware. The program expansion was highlighted during a special event in Dover, featuring Gov. Jack Markell, as well as state and local government, education and civic leaders from the across the state. J. Michael Schweder, president, AT&T-Mid Atlantic represented the company. NEW CASTLE, DE (November 13, 2012) – Today Delaware Governor Jack Markell joined officials from AT&T, Communities in Schools of Delaware (CISDE), and other community leaders to announce a $300,000 contribution to CISDE as part of the AT&T Aspire initiative. The announcement was made at William Penn High School, one of five high schools in Delaware that partner with CISDE to provide services to students. CISDE is one of 47 Aspire grant recipients nationwide that this year shared nearly $10 million under AT&T Aspire, one of the largest corporate commitments focused on helping students graduate and prepare for college and careers. AT&T announced an additional quarter-billion-dollar expansion to the program earlier this year, bringing the total commitment to $350 million since the program was launched in 2008. Communities In Schools of Delaware is part of the largest and most effective dropout-prevention organizations in the nation, and the only one proven to both decrease dropout rates and increase graduation rates. AT&T’s contribution will provide support for site coordinators at Dickinson High School, McKean High School, Newark High School and William Penn High School to focus on nearly 300 students at risk of dropping out of school. Schweder added that CISDE received $104,000 in 2010 during the first round of AT&T Aspire, allowing the organization to support and enhance its work in the Wilmington area. 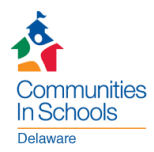 With this new National Aspire Grant, CIS of Delaware will be able to expand its work by helping to support four Delaware High Schools in New Castle County. CISDE facilitates and develops mentoring/tutoring, after-school programming, individualized interventions, counseling sessions, and family assistance. Communities In Schools positions a dedicated site director inside partner schools. In this pivotal role, the director works with school staff to identify students at risk of not graduating. He or she assesses school and student needs and establishes relationships with local businesses, social service agencies, health care providers, and volunteer organizations to harness needed resources, making student success initiatives more effective and efficient. One hundred and seventy seven 9th grade students have been specially chosen for inclusion in a multi-year evaluation, focused on facilitating the Communities In Schools model. Goals of this initiative include improving attendance, behavior, academic performance, and graduation rates. An additional 76 students in grades 10 through 12 will also be monitored for progress. “CISDE is celebrating its 20th anniversary at William Penn High School. We are proud of the relationship that has grown over the past two decades. Through workshops, mentoring and resource brokering, CISDE has had a positive impact on the students we serve,” said Kevin White, assistant principal at William Penn High.